The Soviet Union’s two primary antitank rifles saw wide use in World War II despite the limitations of their small calibers. The German panzers approached the Russian artillery column as it moved to a new position. As the troops trudged toward their new firing point, six panzers appeared, rampaging into the Russian rear area, no doubt searching for vulnerable targets to destroy. The long line of Red Army trucks, which had cannons hitched behind them, were helpless. By the time they could be unlimbered and brought into action it would be too late. As the tanks closed in for the kill, a Russian private jumped down from an ammunition caisson. He sprinted toward a low mound nearby. In his arms he clutched an antitank rifle, a heavy, cumbersome weapon that used a large-caliber cartridge more than six inches long. Taking up a firing position behind the sparse cover of the mound, he took careful aim over his weapon’s open sights at the leading tank. As the steel monster rolled closer to the private and his comrades, he opened fire, striking the tank. The heavy bullet struck a vulnerable spot, stopping the panzer literally in its tracks. With the lead German vehicle stopped temporarily, the other tanks ceased advancing. The few precious moments of confusion gave the Russian artillerymen the chance they needed. Bringing their guns into action, they opened fire with their large-caliber guns, quickly knocking out four of the six tanks and causing the other two to make a hasty retreat. The Russian unit survived to fight another day, thanks to the bravery of one soldier and his skill with his antitank rifle. The combat incident originally appeared in the Red Star, the official publication of the Red Army. It was reprinted in the U.S. Army’s Intelligence Bulletin in January 1943 as part of a broad effort by the Allies to share lessons learned with each other. The antitank rifle was one of the most common tank-killing weapons available at the beginning of World War II. Like many of that conflict’s weapons, it had its beginning in World War I. During that war many new weapons were developed to break the trench warfare deadlock on the Western Front. The tank was one answer to that problem. The armor on the early tanks was comparatively thin. Since the Allies had a near-monopoly on tanks, it was only natural the Germans were first to developed an antitank rifle. These weapons were essentially large rifles that fired a powerful cartridge with a solid shot projectile of small caliber. The first operational antitank rifle was the German Mauser 1918 T-Gewehr. It fired a 13.2mm round, roughly .525 caliber, and could penetrate 22mm of armor at 100 meters. The rifle was a bolt-action, single-shot weapon weighing approximately 41 pounds loaded. The Mauser T-Gewehr would set the pattern for antitank rifles until well into World War II. The only other comparable arm at the time was the American M2 .50-caliber machine gun, designed in part as a dual antitank and antiaircraft weapon, a role in which it served until the late 1930s when increases in tank armor thickness and design rendered it obsolete as a tank killer. Following the Russian Revolution, the Red Army began work on its own antitank rifles. Initially, state arsenals simply copied the Mauser T-Gewehr using an indigenous 12.7mm round designed for a new heavy machine gun. Although the weapon worked, the Russians were looking forward. They were experimenting with their own tank designs and many of their trials were being carried out within the borders of the Soviet Union in secret cooperation with the Germans. They predicted the coming improvements in tank design and armor thickness and realized the 12.7mm round would not be useful against tanks for very long. The Red Army began work in 1932 on a new weapon with the firepower to keep pace with the steadily improving tank designs. At first the Soviets moved away from the rifle concept toward a 37mm recoilless design, but after several years of development and trials that weapon was abandoned. The Red Army resumed work on the antitank rifle in 1936 and began vigorously experimenting with new designs. The army tested no fewer than 15 new weapons from several design teams over a two-year period. For various reasons, though, all were rejected as unsatisfactory. The Red Army eventually decided to create an entirely new round, and yet another design team was set to the task of producing it. The design team produced a 14.5mm cartridge with a steel core that was capable of penetrating 20mm of armor at a slope of 30 degrees at 500 meters. Since sloped armor forces the projectile to push through a greater portion of the armor plate itself, this was equivalent to about 34mm of nonsloped armor. The Red Army eventually adopted a tungsten-core projectile to increase penetration at shorter ranges. The 14.5mm had a muzzle velocity of around 3,300 feet per second. With acceptable ammunition selected, it remained to develop an appropriate weapon. After further testing, the Red Army chose Nikolay Rukavishnikov’s design. Before the new type could enter service, though, the Russians decided not to produce antitank rifles and the design was shelved. When the Germans invaded the Soviet Union on June 22, 1941, the Red Army began working on multiple tank-killing weapons, including antitank rifles. The Rukavishnikov was a fairly complex design, and it was not believed enough could be produced in time. The Red Army therefore issued an order for new, easy-to-produce arms and two of the Soviet Union’s most famous designers proved up to the challenge. They created weapons that compared favorably to similar designs, such as the British Boys Rifle and the German Panzerbuchse series. The first was the PTRD, which was the brainchild of Vasily Degtyaryov. During the 1930s, Degtyaryov had designed a number of automatic weapons. Within a month of the order, he came up with a semiautomatic type which he quickly modified to be a simple single-shot weapon firing the 14.5mm round. The PTRD was 79-inches long with a 48.3-inch barrel. It weighed 38 pounds and used an unusual bolt action. The PTRD was loaded by inserting a cartridge and closing the bolt by hand. When firing the rifle, the recoil pushed the barrel back along a slide until it hit a small cam, which unlocked the breech and opened the bolt. The barrel then returned to firing position, and the cartridge case was extracted and ejected. A bipod attached to the barrel provided stability for more accurate firing and was necessary to support the PTRD’s weight. The original projectile carried a small incendiary mixture that created a flash upon impact, which allowed the gunner to see where the round struck. When the Red Army adopted the tungsten-cored ammunition, this feature was dropped because the PTRD was no longer effective at the longer ranges where the flash was truly useful. The second weapon was Sergei Simonov’s PTRS. The PTRS was a semiautomatic weapon with an attached five-round magazine. It had to be loaded using a clip, not unlike bolt-action rifles of the period. The magazine was hinged at the front so it could be opened for cleaning, which was a common feature of Simonov’s weapons. The PTRS was both heavier and larger than the PTRD. It weighed 46 pounds and was 84 inches long. The PTRS used gas operation, meaning a small portion of the gases created by firing the weapon were used to cycle the action. This process ejected the spent cartridge case and returned the bolt to the rear so that it slid a fresh round out of the magazine and into the chamber. This model also used a bipod for stabilization and support. With the Red Army’s desperate need for weapons, both designs were accepted for service. Each entered production as fast as possible. The Red Army began issuing them to frontline troops in November 1941. In the dark days of 1941 and 1942, the Soviets managed to perform numerous miracles of weapons production manufacturing many new weapons while simultaneously relocating much of their industry eastward away from the rapidly advancing German Wehrmacht. These new weapons saw their first combat use in late November 1941 near the town of Petelino. Eight of them were issued to soldiers of the 1075th Rifle Regiment, part of the 8th Guards Rifle Division. Soviet infantry used the two antitank rifles against German panzers at ranges of 150 to 200 meters. Soviet infantry using the PTRD disabled two panzers during the fighting. Although it was certainly possible to damage or even destroy a tank with such a weapon, it was not easy since they were underpowered against medium or larger tanks. Neither weapon was considered particularly accurate because of the simple iron sights with which they were fitted, rather than more expensive and delicate optics. Still, through a sufficient volume of fire, skill, and luck the weapon could be effective. It was solution to the problem of enabling the infantry to fight tanks, though far from a perfect one. 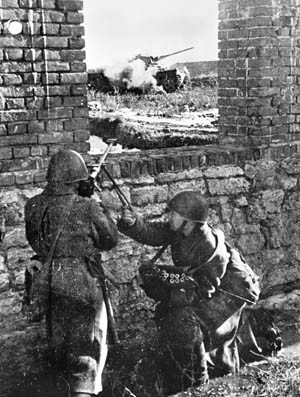 Soviet soldiers fire a PTRD-41 antitank rifle from a protected position at a German tank on the Eastern Front in 1943. Although not powerful enough to penetrate the thick frontal armor of German tanks, the rifles were capable of breaking through their thinner side and rear armor. Since the antitank rifle was an imperfect answer, the Red Army developed new tactics and doctrine to enhance their effectiveness. The antitank rifle required a two-man crew consisting of a gunner and loader. Compared to large-caliber antitank cannons, the antitank rifle crew could put its weapon into action more quickly and fire its rounds faster than the cannon. The crew could be readily concealed since the antitank rifles were relatively small and sat low to the ground. One drawback of this low profile was the amount of dust or snow kicked up by the muzzle blast. In the dry conditions of a Russian summer or the snow-covered landscapes of winter, the muzzle blast could easily give away the gunner’s position and draw deadly counterfire. To solve this dilemma, soldiers could wet the ground around their position or place a blanket or poncho under the muzzle area. In one well-documented case published in the Red Star, a Russian unit reported success using squads of soldiers armed with three antitank rifles. The weapons would be placed 15 to 20 yards apart, far enough to keep them from being knocked out en masse by enemy fire but still close enough to allow them to concentrate their fire on the same part of a single target. Massing their fire allowed these teams to have a greater chance of disabling a tank than a single shooter. Gunners often let tanks rumble past their position so that they could target the thinner armor in the rear. Russian infantry also used the antitank rifles in defensive positions. The Red Army supplied its artillery batteries with them to give them a weapon that could be repositioned quickly if necessary to fend off a flank attack by enemy armor. Artillery officers usually tried to position them with the best fields of fire toward a direction where tank attack seemed most likely, such as along roads and open fields. When placing antitank rifles in a trench system, circular pits were dug to allow the weapon 360-degree traverse. Each position was connected to rifle and machine-gun positions to provide supporting fire. The leftover dirt would be used to create false positions to distract enemy fire. When possible, the antitank rifles would be tied into a layered defense with antitank mines, obstacles, and other weapons in the hopes of luring German panzers into kill zones where they could be immobilized and destroyed in succession. Just as in other armies, the Russians published pamphlets containing lessons learned for their soldiers. Allied armies frequently swapped tips to help their respective soldiers improve their combat performance. The November 1942 issue of the Intelligence Bulletin contained a list of key tips from Russian antitank riflemen. The list stressed teamwork between the gunner and loader. It also advised the crews to let enemy tanks approach to within 200 yards so as to make their hits more effective and advised targeting the lead tank on a narrow road to block the path of following vehicles. Further instructions included where to aim and how to lead a target. If a tank was moving at 36 miles per hour, which was roughly the top speed for many light and medium tanks, the gunner would have to lead the target by one yard for every 100 yards of range. Examination of German tanks revealed firing at the center of the rear half of the tank made it more likely a shot would damage the engine, while a shot to the rear of the turret was more likely to hit the tank’s ammunition or gunner. The 14.5mm round was heavy enough that corrections for wind were generally unnecessary at ranges under 400 yards. Soldiers aware of such details could increase the chance of damaging a panzer. 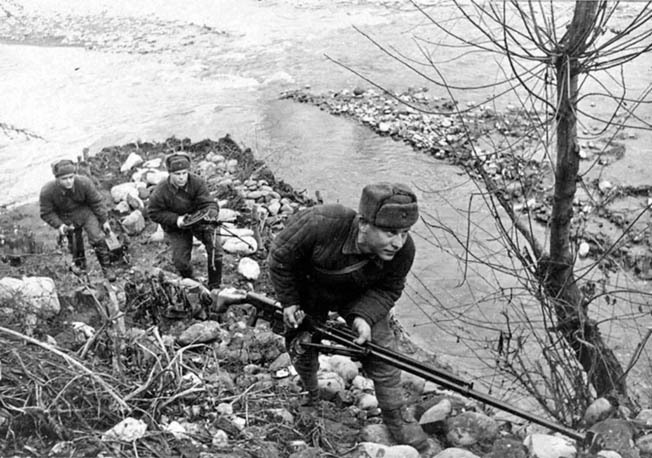 A Soviet antitank rifle team, which includes a light machine gun, advances cautiously during combat in the Caucasus Mountains in 1942. Soviet antitank teams often let German tanks rumble past their position so that they could target the thinner armor in the rear. Both antitank rifles proved equally effective in combat, enough so that almost a quarter million were manufactured during 1942 alone. Although it might seem the semi-automatic PTRS would be the preferred weapon of the two, the PTRD’s simpler operation and robust construction placed it above its more complex brother. The PTRD was also lighter and a little smaller, making it easier to operate overall. With a trained crew, the single-shot weapon could fire fast enough to get the job done, eight to 10 rounds per minute being easily possible. Eventually production shifted exclusively to the PTRD, though both weapons remained in service through the end of the war. As the war progressed, the Russians and Germans began a tank arms race, each side racing to construct ever more powerful tanks with thicker armor as well as more powerful antitank guns to defeat the thicker armor. In this circular competition, the antitank rifles gradually became obsolete. New tanks such as the Panzer V “Panther” possessed thick, sloped armor and most of the various tank destroyers the Germans were producing in 1943 and the years after were equally well protected. The Red Army had to accept that the antitank rifle had fallen hopelessly behind the curve. By late 1944 production of the weapon type ceased altogether. Although their usefulness as a tank killer was over, the PTRD and PTRS were far from useless on the battlefield. Even with the manufacturing lines closed, there were hundreds of thousands of them still in the hands of soldiers. Even in the cauldron of the Eastern Front tanks were not everywhere, but trucks, half-tracks, armored cars, and tractors were common enough. Antitank rifles had always been used against these softer targets when the opportunity arose and they continued in this role. They therefore became what in modern military parlance are called antimaterial rifles. In this fashion, both designs served until the end of the war. After World War II, the Soviets distributed both weapons to their allies around the world. Both the North Korean and Chinese armies used them during the Korean War. During this conflict an enterprising American ordnance officer, Captain William Brophy, wanted to create a long-range sniper rifle. Brophy was a World War II veteran of the Pacific and a competitive shooter since the 1930s, so he knew such a rifle was possible. The existing .30-caliber weapons were simply inadequate for the distances he contemplated. He took a captured PTRD and fitted it with the barrel from an American .50-calliber machine gun along with a scope. The weapon worked, and Brophy was able to hit targets as far out as 2,000 yards. The U.S. Army subsequently tested the hybrid at Aberdeen Proving Ground, Maryland. The Soviet antitank rifles seemed to fade from the battlefield as newer antitank weapons, such as the rocket-propelled grenades, took precedence. They can still be seen in museums. Some are in the hands of private collectors, a few of whom still shoot them. A quick Internet search reveals videos of them being fired, showing the noise and muzzle blast to good effect. The Soviet Union was renowned for keeping old weapons in storage against future need and the PTRD and PTRS are no exception. Stories abound of vast warehouses holding hundreds of thousands of old small arms, many of which hit the world’s arms markets after the Soviet Union disintegrated. While the veracity of these tales is open to dispute, there is no doubt old Soviet weapons continue to surface. During the war in Eastern Ukraine, a video of soldiers inspecting a weapons cache showed machine guns, rifles, RPGs, and a battered-looking PTRD sitting atop an armored vehicle. The antitank rifle led a relatively short life in combat because it just was not powerful enough to keep up with the rapidly advancing size of the tank itself. There were several other designs that are nothing more than footnotes in military history. The Soviet PTRD and PTRS have enjoyed longer lives than any of those designs. These venerable antitank rifles still manage to appear in conflicts more than 70 years after they were hurriedly designed and put into the hands of Red Army soldiers in an effort to slow the German blitzkrieg. Tags Aberdeen Proving Ground, Allies, American, antitank gun, artillery, battlefield, Blitzkrieg, British, cannon, CIA, Destroyers, EAM, Eastern Front, general, German, German Blitzkrieg, Korea, Korean War, lance, machine gun, Mary, military, military history, museum, North Korea, NSA, OSS, Pacific, Panzer, Panzer V Panther, POW, Red Army, RPG, Russia, Russian Revolution, Sniper, Soviet Union, spars, Squad, Tanks, Tern, The Eastern Front, the german blitzkrieg, the korean war, The Pacific, The Western Front, Tory, Trench Warfare, Troy, Ukraine, Union, US Army, weapons, wehrmacht, Western Front, WIN, World War I.